My first taste of riding a Segway came six years ago, when we partnered up with River Valley Adventure Company for our pop-up Blink: Urban Picnic event held in Louise McKinney Park. During that event, the owner of the company, Chris Szydlowski, gave our attendees mini lessons on Segways, which they were using to lead tours on the area’s trails. I was only able to try the Segway for a few minutes, but I remember not feeling all that comfortable on the vehicle. 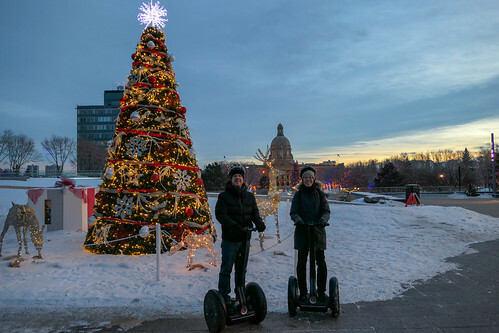 Fast forward to now: River Valley Adventure Company is not only leading tours in green spaces, but starting last year, they also began hosting the Legislature Lights Adventure! The 60-minute tour combines a few of my favourite things – Mack and I are frequent visitors to the grounds during the holidays, as we find that the lights and music create a magical effect. 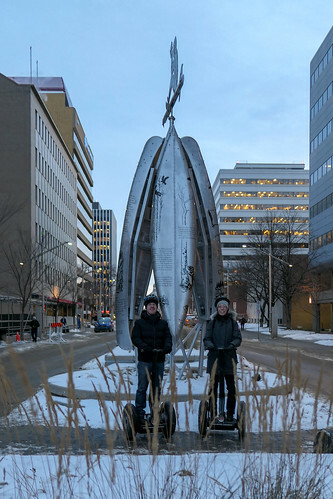 Also, being that he is a very passionate Edmontonian, Chris delights in being able to share fun and interesting facts about the area throughout the journey. He invited us to experience the Adventure for ourselves last Friday. We met him in the visitor parking lot south of the Terrace Building, where he had positioned three Segways. Because neither Mack or I were experienced Segway riders, Chris added a 30-minute introduction clinic to get us started. It was the mark of a great teacher, because after that lesson, I felt surprisingly confident on the Segway. I had been afraid of tipping or losing control of the machine, but with his expert instructions, I was able to trust in using what I had learned to ride, stop, and safely disembark the Segway. Something I should have done was listened to his advice on layering up for the conditions! He had recommended dressing like we were “headed for the mountains”, but at -8C that evening, we didn’t think it was necessary. However, at times, when we were cruising along at the top speed of 20km/hour, it was a bit more biting than what we are used to as pedestrians. Our feet, in spite of not standing directly on the cold pavement, also could have used proper snow boots. Chris shared that in its second year, the Legislature Lights Adventure had already more than doubled its bookings when compared with the previous year. And while many who have attended the tour have been from out of town, some were playing tourist in their own home. Certainly for us, we learned many facts that we did not know – Chris took us to the spot (commemorated by a plaque) that was the home to one of the previous Fort Edmontons. In addition, we found out that the domed fountain that operates in the summer is actually an exact sized replica of the Legislature’s dome! 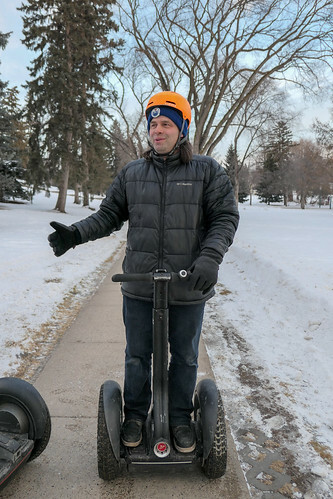 Chris told us that Edmonton is one of the most Segway-friendly cities in Canada; the vehicles are permitted on city sidewalks. It so happened that our tour coincided with rush hour, so for our brief trek up Capital Boulevard to admire the public art, Chris was adept at guiding us to cross streets safely and warning pedestrians of our presence with a bike bell. For those hoping to document their experience, Chris makes sure to build in a number of photo opportunities along the way. As we started in the late afternoon, the lights didn’t have as dark of a backdrop to shine against. The public tours are offered later in the evening, however, so would be adventurers needn’t worry! Overall, the tour was a fun way to explore one of my favourite places Downtown, and one that I would highly recommend! Thanks again to Chris for the invitation to experience the Legislature grounds on a unique set of two wheels. 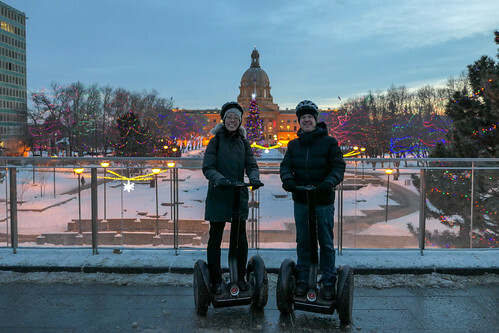 The Legislature Lights Adventure is available until January 31, 2019.